Right-Hand Figure—Evening Toilette,—A tulle and lace cap, ornamented with satin ribbon. A silk dress, ornamented down the front with embroidery and lace; the corsage of drawn tulle over coloured silk. 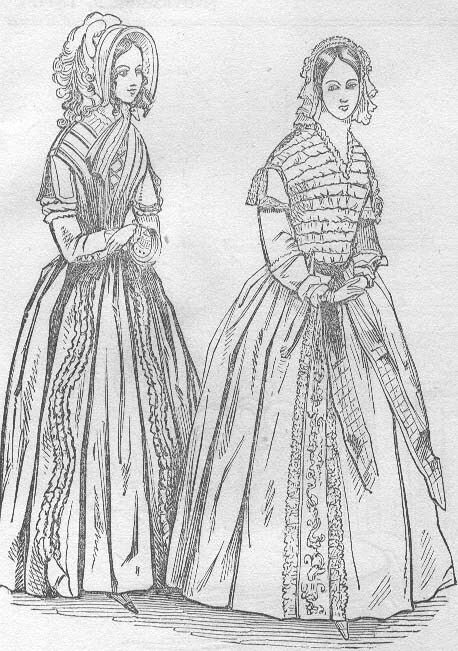 Left-Hand Figure,—A promenade dress of African sand colour silk, ornamented with two bouillons, serpentining down each side the front; corsage with plaits from the shoulder to the waist, under sleeves of embroidered muslin, Hat of Terry velvet, trimmed with rolls of the same. Right-Hand Half-Length Figure.—A hat of uncut velvet, trimmed with bands of narrow black velvet ribbon. A velvet cloak, with embossed border, and trimmed with corded fringe. Skirt with one very deep volant, headed with a bouillon of the same. Left-Hand Half-Length Figure—Evening Toilette.—Hair coiffure ornamented with a wreath of roses without leaves. A satin dress, trimmed round the corsage and down each side the front with bouillons of tulle and roses without leaves. CHAPEAUX and CAPOTES, the favourite materials for which are velvet, velours epingle, and satin. Feathers, of the lightest and most elegant kinds, will be more in vogue for trimmings than flowers. Velvet panachees will be the favourite flowers. Drawn Bonnets of velvet will be very fashionable. A new style of trimming, composed of noeuds of shaded velvet ribbon and blonde lace, will be in vogue. CLOAKS, PELISSES, &c.—Cloaks of rich black silk will be very fashionable; also the Manteau Russe and the Paletot Grec, made either of satin or velvet. The favourite form for Pelisses is the Robe Amazone, descending on the hips, in the jacket style, and trimmed with favour velvet. PROMENADE ROBES are made in the pelisse form, with the corsage slightly opened, showing the rich embroidery of the chemisette. Close corsages will increase in favour as the season advances. They will be braided and trimmed with velvet bands and buttons, also velvet ribbons. Silks, Pekins of Thibet down, basino de laine, tartanelles, and merinos of various kinds, will be the favourite materials. Furs will be much worn. 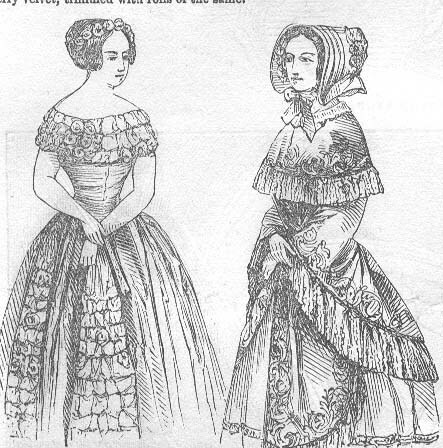 EVENING DRESSES will be made generally with low-pointed corsages, and round at the bosom, sleeves short, but not near so short as they have been, Velvet Robes have the sleeves much shorter. Flounces will be in vogue; also ruches, and other garnitures of ribbon. Demi-trains will be worn. For Ball Dresses, an embroidery in straw, of a very light and novel description, will be introduced; also, fringes of gold and silver, and net-work of small pearl bead-heads. CAPS retain their vogue, The new trimming is a chicoree wreath of ribbon in five different shades. Wreaths of oak leaves for evening caps. The turban Algerienne, composed of a gold or silver gauze scarf, ornamented with diamond epis, will be the favourite turban. Hats of crape decorated with feathers of the lightest kinds will be very fashionable, Colours, pomona green, dark blue, ruby, violet ponceau, pearl grey, chocolate, and neutral tints will be most used.